zlien releases a construction lien waiver management module enabling subcontractors and suppliers to electronically generate, store, sign, and transmit construction lien waivers in all 50 states. The module is part of zlien’s powerful LienPilot platform, which gives the industry total control of lien and bond claim compliance. We built this aiming to not only relieve companies of an administrative task, but to empower companies to use lien waiver forms with high legal integrity to protect against payment abuses. zlien, the nation’s leading platform for mechanics lien and bond claim compliance, today announces the release of a lien waiver management module enabling companies to generate, store, and electronically transmit construction lien waivers in all 50 states. 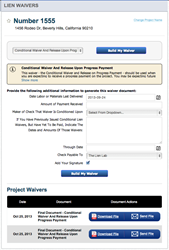 zlien’s construction lien waiver module enables companies to generate an unlimited number of waivers for any project. Users have control over a waiver’s content, and the platform keeps track of all waivers created and sent for a project. Using the lien waiver module is completely free. To support the launch of its construction lien waiver module zlien published a tutorial online video demonstrating how to use the feature. zlien also published multiple lien waiver resources including free downloadable lien waiver forms, color coded maps outlining the lien waiver rules and restrictions in each state, and multiple educational articles about construction lien waiver management. Education about the entire mechanics lien and bond claim process is one of zlien’s core offering, and in fact, inspired the lien waiver module itself.